Mumbai: The UK’s commercial court has passed an order in favour of a consortium of 13 Indian banks seeking to recover dues allegedly owed to them by liquor baron Vijay Mallya, who is fighting extradition on charges of fraud and money laundering to the tune of ₹ 9,000 crore. The order by the commercial court, part of the high court in London, also grants permission to an enforcement officer to enter the 62-year-old tycoon’s properties in Hertfordshire, near London. “The High Court Enforcement Officer, including any Enforcement Agent acting under his authority, may use reasonable force to enter the Property if necessary," the order states. Banks have the option of using the order, passed on 26 June, as one of the means to recover estimated funds of around £1.145 billion. 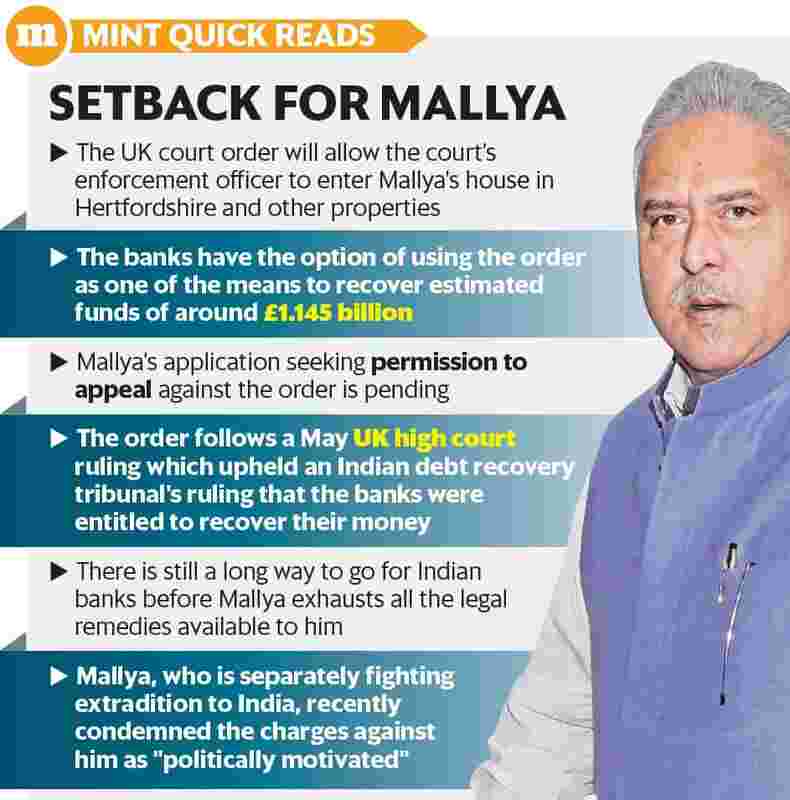 The order relates to the UK’s Tribunal Courts and Enforcement Act 2007 and follows a UK high court ruling in May which refused to overturn a worldwide order freezing Mallya’s assets and upheld an Indian court ruling that Indian banks were entitled to recover their funds. It marked the first recorded case of a judgement of the debt recovery tribunal in India being registered by the English high court, setting a legal precedent. The victory for the 13 Indian banks—State Bank of India, Bank of Baroda, Corporation Bank, Federal Bank Ltd, IDBI Bank Ltd, Indian Overseas Bank, Jammu & Kashmir Bank, Punjab & Sind Bank, Punjab National Bank, State Bank of Mysore, UCO Bank, United Bank of India and JM Financial Asset Reconstruction Co. Pvt. Ltd —enables them to enforce the Indian judgement against Mallya’s assets in England and Wales. Mallya has made an application in the Court of Appeal seeking permission to challenge the order, which remains pending. Mallya, who is separately fighting extradition to India, recently termed the charges against him as politically motivated. He took to social media to clarify that he made the statement “after a long period of silence" because he had filed an application before the Karnataka high court on 22 June, setting out available assets of approximately ₹ 13,900 crore. The former Kingfisher Airlines promoter remains on bail since his arrest (on an extradition warrant) in April last year. A judgement is expected in the case at a later date. While the prosecution claims it has successfully established a prima facie case of fraud against the businessman, Mallya’s lawyers have sought to establish that the criminal charges against him are “without substance". They have also challenged the case on human rights grounds, questioning the conditions at Arthur Road Jail in Mumbai, where the businessman would be held if he is extradited. “This is a very encouraging order for the consortium of lenders," said Zulfiqar Memon, managing partner of boutique white collar crime practice MZM Legal. “An application by Vijay Mallya requesting leave to appeal this order is yet to be decided and it is only after this application is decided that we will all have more clarity as to the effect of this development." There is still a long way to go for Indian banks before Mallya exhausts all the legal remedies. “Vijay Mallya has the option to appeal this order in the Supreme Court of England, where he can argue that till the court gives a final decision, no adverse steps should be taken against him. Subsequently, Mallya will get an opportunity to take the final appeal in the House of Lords," said a person aware of the development. Punjab National Bank managing director and chief executive officer Sunil Mehta said that his bank, one of the lenders to Mallya, will carry out a fresh valuation of Mallya’s assets. “While it was difficult to comment on what the fresh valuation of Vijay Mallya’s assets would be, the bank would now pursue the disposal of Mallya’s assets," Mehta told television channels.